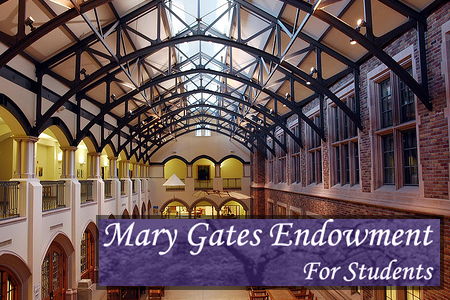 The Mary Gates Endowment for Students is currently accepting scholarship applications. Mary Gates scholarships provide $4,000 ($2,000 per quarter for two quarters) for students to pursue leadership or research activities. These scholarships benefit students in the current academic year, and are open to all UW undergraduate students regardless of class year, major or residency status. Deadlines are coming up soon, so if you are interested you should begin the application process and attend an information session and application workshop! Another round of applications will be accepted in Winter quarter, but it’s good to start planning now! More information can be found at: http://expd.uw.edu/mge. Email mgates@uw.edu with any questions.